The first soft moon landings were accomplished in the 1960’s by the Soviet Luna 9 and the U.S. Surveyor Spacecraft. These were followed by the U.S. Lunar Module landings during the Apollo program. The Soviets had their own LK Lander lunar lander for landing humans on the moon but it never flew. China’s Chang’e-3 landed on the moon on December 13, 2013. India plans to land the Chandrayaan-2 on the moon in 2018. South Korea intends to land a spacecraft on the moon in 2020. The U.S. Lunar Module was flown by a crew but had a digital computer that performed guidance, navigation and control. A great new book by Don Eyles, Sunburst and Luminary an Apollo Memoir explains how that was accomplished with a computer less powerful than those in toaster ovens today. Don played a key role in saving the Apollo 14 mission when an abort light appeared on the crew’s console prior to descent. Read the book for for the whole story. NASA intended follow-ons to the Lunar Module that would have been fully automated for delivering materials to the moon in preparation for a permanent human presence. Unfortunately, those plans never materialized. 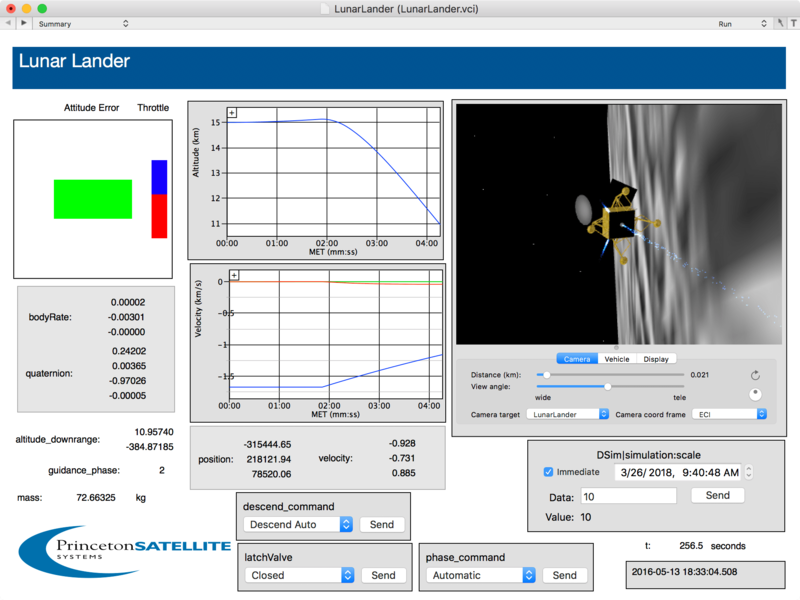 As we are always looking for new missions for testing our Precision Attitude Control System, we added guidance, navigation and control for lunar landings. We use a really simple guidance algorithm called 2nd order guidance. It is nothing more than a Proportional Derivative (PD) controller with the landing spot as a target. You can adjust the damping ratio and undamped natural frequency of the controller to mimic more sophisticated, “optimal” guidance algorithms. The 2nd order guidance works until the lander gets near the surface and then it switches to landing algorithm that hovers, nulling any remaining translational velocities and then descends to the surface. Lidar would be used as guidance. Once it is hovering it would need to search for a flat spot for landing. 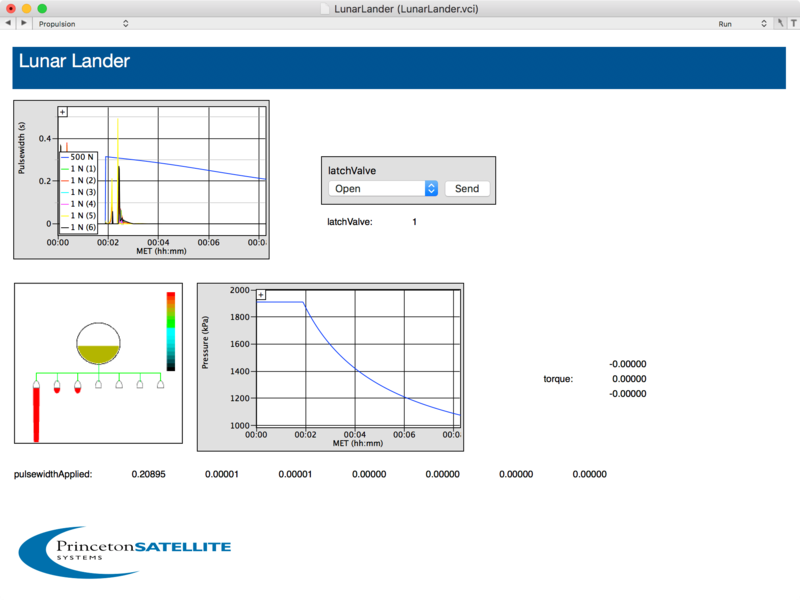 NASA has developed Hazard Detection Software for Lunar Landing that uses lidar. It is available for licensing from Caltech. A close up of the attitude display. 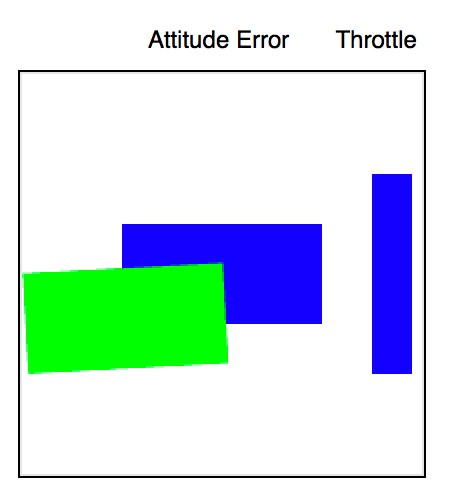 Pitch and yaw are offsets of the green rectangle. Roll is rotation of the rectangle. This is quite primitive but it is easy to add your own displays if you know a little OpenGL! Descent starts and the throttle is about 50% at this point. The two plots are of altitude and velocity. The maneuver starts at 15 km and the target is 600 km along track. 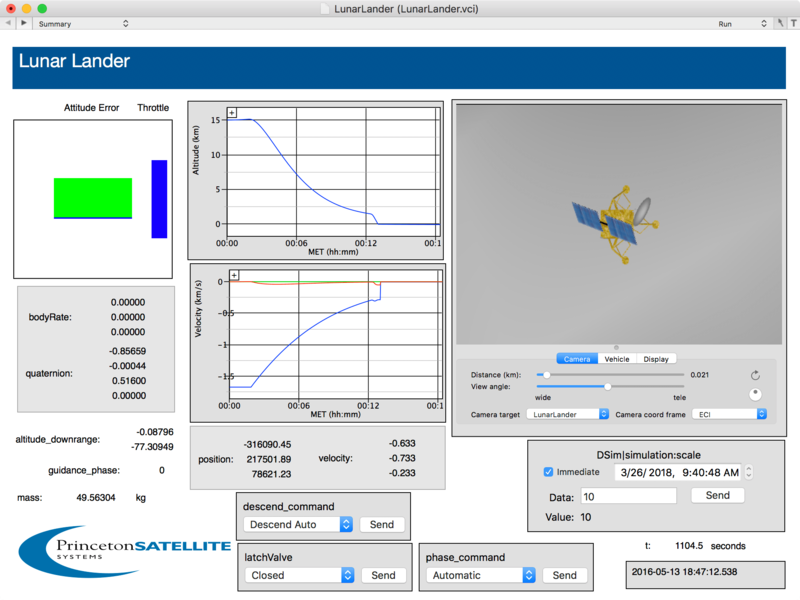 The lander has solar panels on a two-axis gimbal and a high gain antenna, also on a two-axis gimbal. The propulsion page shows two attitude thrusters firing and the main engine. The spacecraft has landed! You can see the terminal descent phase on the altitude and velocity plots. The lunar surface is featureless because we have not added close up maps of the landing zone to the planet display. The descent page shows the throttle settings. 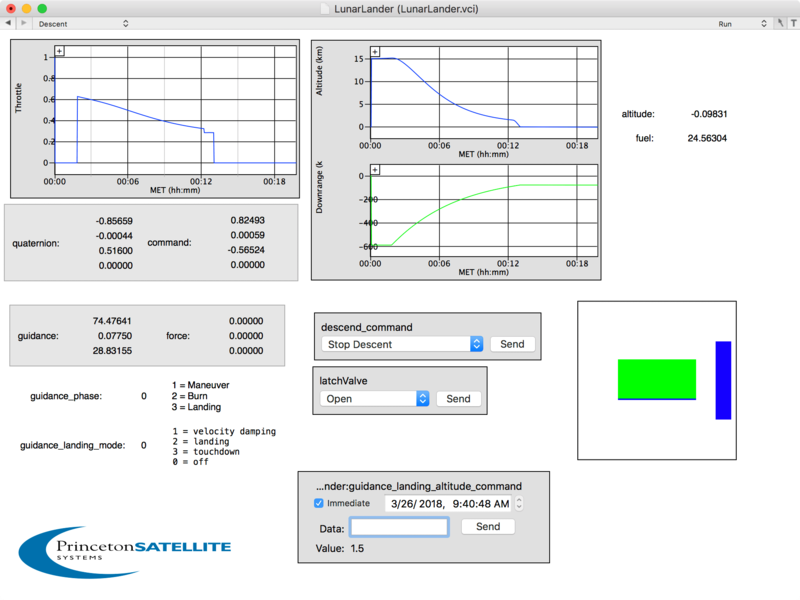 You can monitor the guidance force demand and simulated force. This is the propulsion page. The attitude thrusters get very busy during the terminal descent phase. Note that we have a lot of fuel left! We could have hovered for quite some time. 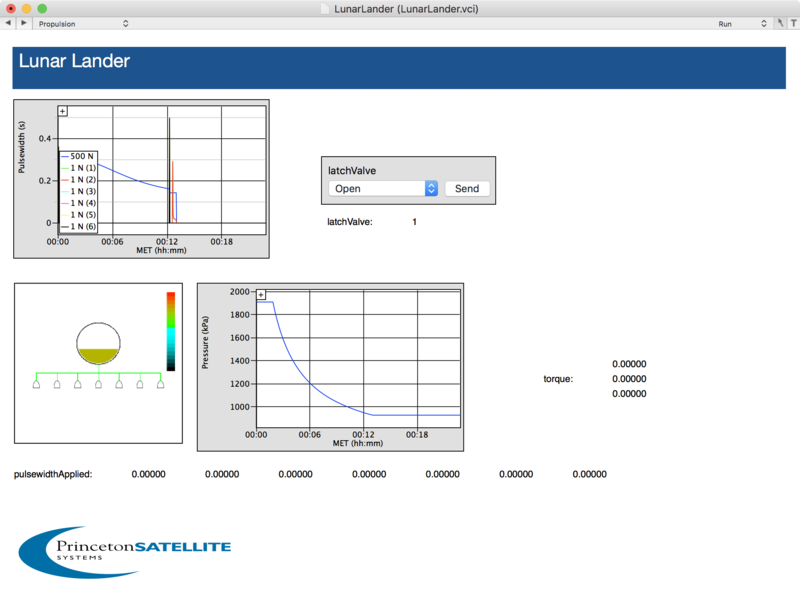 The graphics are from our VisualCommander product that runs on Mac OS X. This GN&C system is capable of autonomous flight from LEO all the way to the moon. It uses our Optical Navigation System, developed under a NASA Phase II SBIR for trajectory determination on the flight to the moon and lunar orbit entry. For more information contact us directly!